A 67-year-old patient, follow-up case of hypertension on treatment, presented with a history of weight loss. No fever or bone pain was reported. He had an episode of hyponatremia in January 2010 and had been having raised gamma globulins persistently for the past few months. On investigation, he was found to have Hb of 12 gm/dL, ESR 32 mm at 1 h, normal serum calcium levels and raised β-2 microglobulin levels (4492 μg/L). His serum protein electrophoresis showed presence of a monoclonal band. 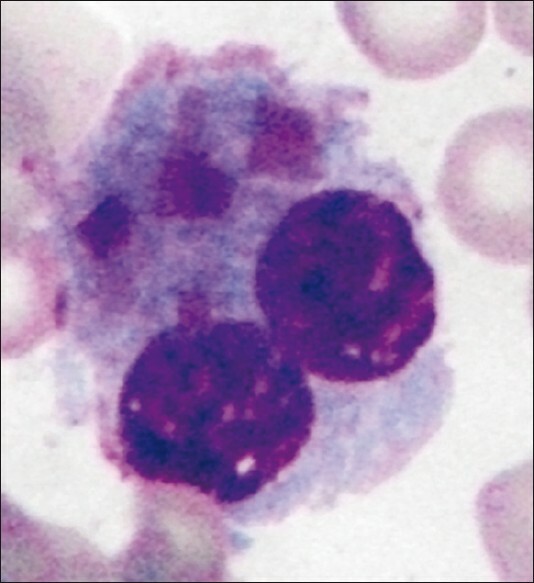 His peripheral smear showed predominantly normocytic normochromic red blood cell morphology with increased rouleaux formation. 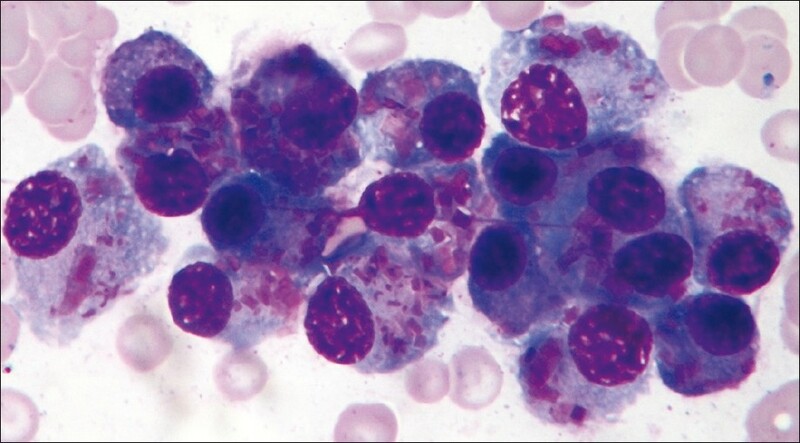 Bone marrow aspiration smears revealed the presence of 15.5% plasma cells along with many binucleate, trinucleate and multinucleate forms, many of which showed the presence of intracytoplasmic eosinophilic crystalline inclusions [Figure 1], [Figure 2], [Figure 3] and [Figure 4]. These inclusions varied in shape from "Auer rod like" rods, rectangular, square and also resembling amorphus debris as well. Periodic acid schiff (PAS) stain and Perls' prussian blue reaction were negative. ANAE/Sudan black/MPO reactions showed refractile bodies. 1. Stewart CJ, Spagnolo DV. Crystalline plasma cell inclusions in helicobacter-associated gastritis. J Clin Pathol 2006;59:851-4. 2. 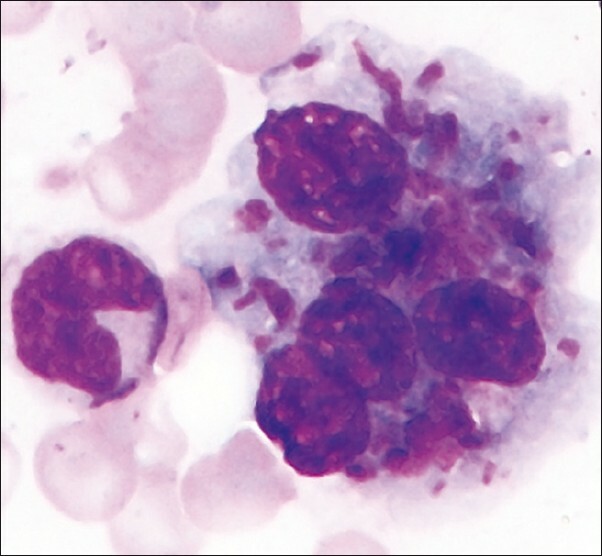 Zioni F, Giovanardi P, Bozzoli M, Artusi T, Bonacorsi G, Sighinolfi P. Massive bone marrow crystal storing histiocytosis in a patient with IgA- Lambda multiple myeloma and extensive extramedullary disease. A case report. Tumori 2004;90:348-51. 3. 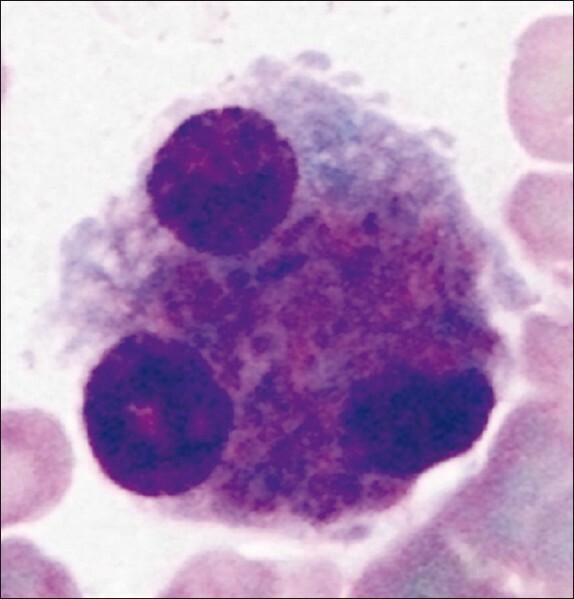 Ali N, Moiz B. Azurophilic inclusions in plasma cells. Singapore Med J 2009;50:e114-5.